Lucerne is one of Europe’s most charming destinations as it offers stunning lakeside scenery in addition to a mountainous panorama. The city’s reputation as a tourist resort is sustained with an incredible choice of year-round attractions and activities. Ideally situated along the Reuss River, Lucerne is what many believe to be the ‘authentic’ Switzerland – picturesque mountains, lakes, alpine villages, and alpine flowers. Our Lucerne, Switzerland vacation guide is here to help you get the most out o your trip! The city center’s pedestrian area is made up of cobbled streets and lined with flower displays, which illuminate the medieval style painted buildings. Above the old town is the original city wall from when Lucerne was only a fishermen’s village. The town is located at the northwest end of Lake Lucerne, making it an excellent base for any additional excursions across Switzerland. The city’s top attraction includes taking a stroll across the famous Chapel Bridge, decorated with beautiful assortment of flowers. Explore Lucerne’s old town by crossing the Chapel Bridge and be covered from rain or sunshine by its wooden structure. It’s construction dates back to the first half of the 14th century and runs along the river leading into the historic section of town. This car free old town is home to Switzerland’s first sacral Baroque building, the Jesuit Church built in the 17th century. Lucerne’s reputation for tradition and modernity can be further explored by checking out the Culture and Convention Center (KKL). However, the most frequently visited museum in Switzerland is the Swiss Museum of Transport given its diversity. 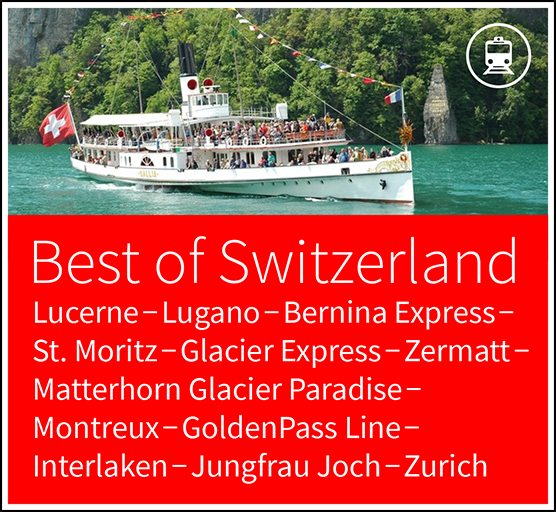 In addition to cultural activities, be sure to gain stunningly beautiful panoramas of the city whether it is by taking a cruise on Lake Lucerne or descending up to the regional mountains with the steepest cogwheel train in the world while on your Lucerne, Switzerland vacation. Full day excursion up to this 2,128m/6,982 ft elevated mountain. 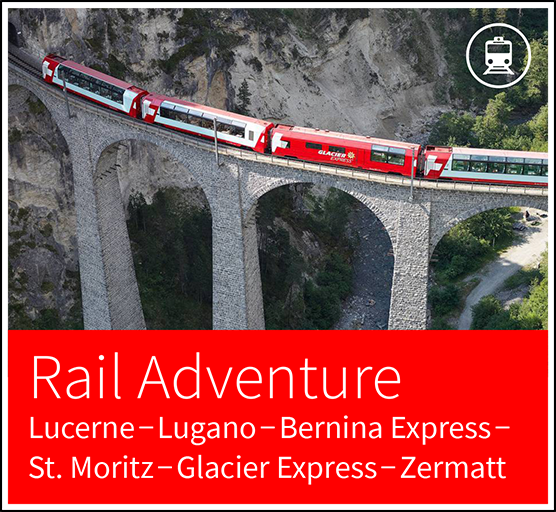 By boarding either the north side’s cable cars or the steepest cogwheel train in the world on the south flank the mountain’s peak is made accessible. When taking the cogwheel, get ready to be impressed as it climbs gradients of 48% on the way to the peak. It is also important to be prepared with warm clothing and good shoes in order to gain the full experience. Visiting Mt. Rigi can be a half or full day excursion while travelling up to its summit at an elevation of 1,798m/5,897 ft. Access “Rigi-Kulm” by first taking a steamboat from Lucerne to Vitznau and then a cogwheel train up the mountain from where you have a marvelous panoramic view. For a boat ride back to Lucerne, head back down with a cogwheel to Rigi-Kaltbad and from there to Weggis with the cable car. An alternate train route would be to head down to Goldau from where a train will bring you back to the city. This is a half or full day excursion up to a 1,898m/6,227 ft elevation includes taking an exciting ride with the world’s first convertible-style cable titled, “CabriO” cable car. It’s upper observatory deck allows for guests to enjoy 360° panoramic views of Mt. Stanserhorn while breathing in the fresh mountain air. Pioneers had enjoyed these very same views long before however using the world record-breaking old-timer funicular, which opened in 1893. Still present, the old timer runs from Stans to Kälti and has become a historical gem to the Stanserhorn. 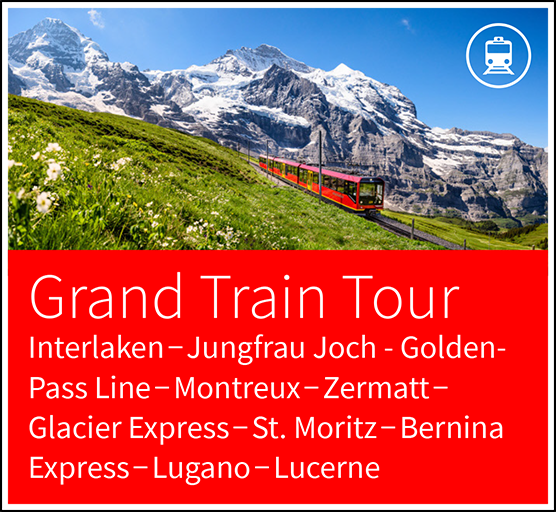 The train ride to the village of Engelberg and Mount Titlis, elevation of 3, 238m/10,623ft, is only a short distance from Lucerne with the duration of about an hour. Engelberg is located at the foot of the Mt. Titlis ski area and is famous for its beautiful Benedict monastery. To travel from Engelberg to Mt. Titlis, hop aboard the world’s first revolving aerial cable car. This is a must see addition to any Lucerne, Switzerland vacation. Beautiful Bern, the Swiss Capital is only an hour away from Zurich. This is a city of medieval magic, listed by UNESCO as a World cultural Heritage. Attractions include the famous clock tower, the new bear park that is home to Bern’s heraldic animals – and excellent shopping arcades. Similar to Bern, Zurich is only an hour train ride away from Lucerne. With it’s gentle hills, peaceful woods, unpolluted lakes and rivers, and picturesque villages, Zurich has become a top location for leisure and pleasure. Aside from its charming old town, Zurich also has many up and coming trendy districts such as Zurich-West. A very lively and vibrant city with plenty of indoor and outdoor shows, musicals, art exhibitions and much more! Given its close proximity, Zurich is a great secondary destination when you take a Lucerne, Switzerland vacation. Lucerne offers hiking for both leisure and adventurous types, as it’s greater region features more than 250 km (155 miles) of maintained paths. Free brochures with detailed hiking maps can be found at the local tourist office. Like most places in Switzerland, Lucerne is a great place for biking as well as mountain biking. Exploring the city on wheels is a very feasible option given Switzerland’s bike friendly infrastructure. Whether you prefer a seven-gear country bike, twenty-seven gear mountain bike, or e-bike, all are available to rent at Rent a Bike located at your desired location. The Lake of Lucerne is crystal clear with many accessible public swimming areas, free of charge. Indoor public swimming pools are also available but may entail an entrance fee. The options for sports in Lucerne are endless and enjoyable. Other available activities include badminton, beach volleyball, billiard/pool, bowling, boating/kayaking, climbing, diving horseback riding, mini-golf, mountaineering, rock-climbing, sailing, squash, tennis and trekking. It is easy to have fun and be active on a Lucerne, Switzerland vacation. 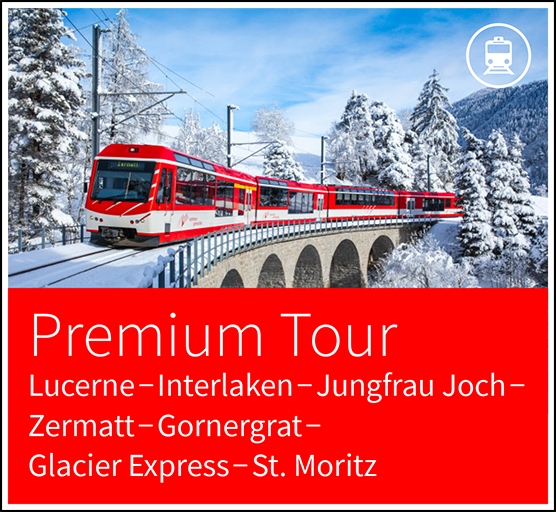 Located so close to the mountains, Lucerne is only a short distance from ski resorts. The closest is Engelberg’s winter sport resort whereas a two-hour train ride would bring you to the Jungfrau peaks. However, there are also local indoor sports facilities readily available that provide swimming, tennis, bowling, fitness and much more. 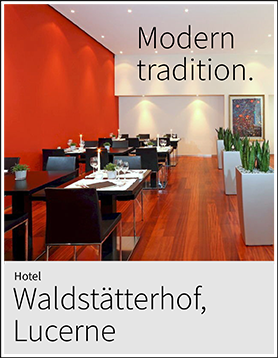 At this restaurant, enjoy an amazing selection of authentic Swiss dishes along with traditional customs and usages. Have an unforgettable experience while exploring original Swiss folklore with alphorns, cowbells, national costumes, flag throwing, and most importantly yodeling! The Culture and Convention Center Lucerne, also known as the KKL, is a magnificent venue for concerts, conferences, and culinary experiences. It is located in close proximity to the railway station and to the landing, its oversized roof can be seen from afar. Treat yourself to some smooth and alluring shopping while exploring Lucerne’s shopping districts. 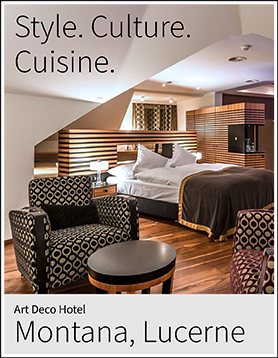 One is located in the charming Old Town, while another along the recently developed Pilatusstrasse – located just outside Lucerne’s Central Station. The Museum is located just outside Lucerne directly on the lake and serves as Europe’s largest, most comprehensive Transport Museum. Displays of transport, mobility, and communication are made educational and fun with the presence of interactive exhibits as well as an IMAX theater. Its most recent added exhibition is titled the Swiss Chocolate Adventure. Developed in conjunction with the Lindt Chocolate Foundation, this chocolate themed voyage educates visitors about the discovery, origin and production processes of chocolate. Observe the traditional craftsmanship of glass making at this Glassworks production site. It’s exhibitions present Hergiswil’s glassmaking history and the evolvement of strategy and design. Visitors can explore this craftsmanship first hand as these glass blowing techniques date back to as early as 1817. Lucerne is centrally located in the heart of Switzerland, with its nearest airport in Zurich, approximately 53 km (33 miles) away. The travel time between these cities is 45 minutes via car or train. 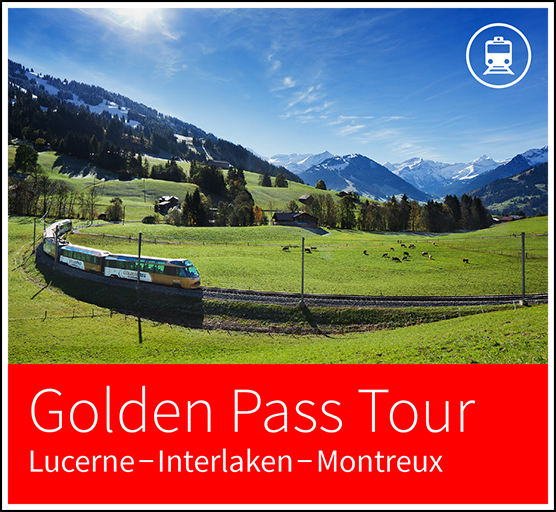 Other top destinations from Lucerne include Geneva, which is 265 km (164 miles), and Bern at 113 km (70 miles). Contact our Lucerne, Switzerland Vacation Guides today by visiting our Switzerland Trip Planner!